Raghuram Rajan: Bankers, promoters, or their backers in government sometimes turn around and accuse regulators of creating the bad loan problem. The truth is bankers, promoters, and circumstances create the bad loan problem. Gross NPAs of banks rose to Rs 10.3 lakh crore in FY18, or 11.2% of advances. Banks wrote off a record Rs 1.44 lakh crore of bad loans in 2017-18. How did the crisis happen? What can be done now? 1) Why did the NPAs occur? I have not seen a study that has unearthed the precise weight of all the factors responsible, but here is a list of the main ones. A larger number of bad loans were originated in the period 2006-2008 when economic growth was strong, and previous infrastructure projects such as power plants had been completed on time and within budget. It is at such times that banks make mistakes. They extrapolate past growth and performance to the future. So they are willing to accept higher leverage in projects, and less promoter equity. Indeed, sometimes banks signed up to lend based on project reports by the promoter’s investment bank, without doing their own due diligence. One promoter told me about how he was pursued then by banks waving checkbooks, asking him to name the amount he wanted. This is the historic phenomenon of irrational exuberance, common across countries at such a phase in the cycle. Once projects got delayed enough that the promoter had little equity left in the project, he lost interest. Ideally, projects should be restructured at such times, with banks writing down bank debt that is uncollectable, and promoters bringing in more equity, under the threat that they would otherwise lose their project. Unfortunately, until the Bankruptcy Code was enacted, bankers had little ability to threaten promoters (see later), even incompetent or unscrupulous ones, with loss of their project. Writing down the debt was then simply a gift to promoters, and no banker wanted to take the risk of doing so and inviting the attention of the investigative agencies. Stalled projects continued as “zombie” projects, neither dead nor alive (“zombie” is a technical term used in the banking literature). It was in everyone’s interest to extend the loan by making additional loans to enable the promoter to pay interest and pretend it was performing. The promoter had no need to bring in equity, the banker did not have to restructure and recognize losses or declare the loan NPA and spoil his profitability, the government had no need to infuse capital. In reality though, because the loan was actually non-performing, bank profitability was illusory, and the size of losses on its balance sheet were ballooning because no interest was actually coming in. Unless the project miraculously recovered on its own – and with only a few exceptions, no one was seriously trying to put it back on track – this was deceptive accounting. It postponed the day of reckoning into the future, but there would be such a day. How important was malfeasance and corruption in the NPA problem? Undoubtedly, there was some, but it is hard to tell banker exuberance, incompetence, and corruption apart. Clearly, bankers were overconfident and probably did too little due diligence for some of these loans. Many did no independent analysis, and placed excessive reliance on SBI Caps and IDBI to do the necessary due diligence. Such outsourcing of analysis is a weakness in the system, and multiplies the possibilities for undue influence. Banker performance after the initial loans were made were also not up to the mark. Unscrupulous promoters who inflated the cost of capital equipment through over-invoicing were rarely checked. Public sector bankers continued financing promoters even while private sector banks were getting out, suggesting their monitoring of promoter and project health was inadequate. Too many bankers put yet more money for additional “balancing” equipment, even though the initial project was heavily underwater, and the promoter’s intent suspect. Finally, too many loans were made to well-connected promoters who have a history of defaulting on their loans. Yet, unless we can determine the unaccounted wealth of bankers, I hesitate to say a significant element was corruption. Rather than attempting to hold bankers responsible for specific loans, I think bank boards and investigative agencies must look for a pattern of bad loans that bank CEOs were responsible for – some banks went from healthy to critically undercapitalized under the term of a single CEO. Then they must look for unaccounted assets with that CEO. Only then should there be a presumption that there was corruption. The investigative agencies blame the banks for labeling frauds much after the fraud has actually taken place, the bankers are slow because they know that once they call a transaction a fraud, they will be subject to harassment by the investigative agencies, without substantial progress in catching the crooks. The RBI set up a fraud monitoring cell when I was Governor to coordinate the early reporting of fraud cases to the investigative agencies. I also sent a list of high profile cases to the PMO urging that we coordinate action to bring at least one or two to book. I am not aware of progress on this front. This is a matter that should be addressed with urgency. When I took office it was clear that bankers had very little power to recover from large promoters. The Debts Recovery Tribunals (DRTs) were set up under the Recovery of Debts Due to Banks and Financial Institutions (RDDBFI) Act, 1993 to help banks and financial institutions recover their dues speedily without being subject to the lengthy procedures of usual civil courts. The Securitization and Reconstruction of Financial Assets and Enforcement of Security Interests (SARFAESI) Act, 2002 went a step further by enabling banks and some financial institutions to enforce their security interest and recover dues even without approaching the DRTs. Yet the amount banks recover from defaulted debt was both meager and long delayed. The amount recovered from cases decided in 2013-14 under DRTs was Rs. 30590 crores while the outstanding value of debt sought to be recovered was a huge Rs 2,36,600 crores. Thus recovery was only 13% of the amount at stake. Worse, even though the law indicated that cases before the DRT should be disposed off in 6 months, only about a fourth of the cases pending at the beginning of the year were disposed off during the year – suggesting a four year wait even if the tribunals focused only on old cases. However, in 2013-14, the number of new cases filed during the year were about one and a half times the cases disposed off during the year. Thus backlogs and delays were growing, not coming down. A cautionary point as we welcome the NCLT’s efforts is that the DRTs and SARFAESI were initially successful, before they became overburdened as large promoters understood how to game them. The RBI decided we needed to empower the banks and improve on the ineffective CDR system then in place. Our first task was to make sure that all banks had information on who had lent to a borrower. So we created a large loan database (CRILC) that included all loans over Rs. 5 crore, which we shared with all the banks. The CRILC data included the status of each loan – reflecting whether it was performing, already an NPA or going towards NPA. That database allowed banks to identify early warning signs of distress in a borrower such as habitual late payments to a segment of lenders. We also wanted to stop ever-greening of projects by banks who want to avoid recognizing losses – so we ended forbearance, the ability of banks to restructure projects without calling them NPA in April 2015. At the same time, a number of long duration projects such as roads had been structured with overly rapid required repayments, even though cash flows continued to be available decades from now. So we allowed such project payments to be restructured through the 5/25 scheme provided the long dated future cash flows could be reliably established. Of course, there was always the possibility of banks using this scheme to evergreen, so we monitored how it worked in practice, and continued tweaking the scheme where necessary so that it achieved its objectives. Loan classification is merely good accounting – it reflects what the true value of the loan might be. It is accompanied by provisioning, which ensures the bank sets aside a buffer to absorb likely losses. If the losses do not materialize, the bank can write back provisioning to profits. If the losses do materialize, the bank does not have to suddenly declare a big loss, it can set the losses against the prudential provisions it has made. Thus the bank balance sheet then represents a true and fair picture of the bank’s health, as a bank balance sheet is meant to. Of course, we can postpone the day of reckoning with regulatory forbearance. But unless conditions in the industry improve suddenly and dramatically, the bank balance sheets present a distorted picture of health, and the eventual hole becomes bigger. Bankers, promoters, or their backers in government sometimes turn around and accuse regulators of creating the bad loan problem. The truth is bankers, promoters, and circumstances create the bad loan problem. The regulator cannot substitute for the banker’s commercial decisions or micromanage them or even investigate them when they are being made. Instead, in most situations, the regulator can at best warn about poor lending practices when they are being undertaken, and demand banks hold adequate risk buffers. The RBI is primarily a referee, not a player in the process of commercial lending. Its nominees on bank boards have no commercial lending experience and can only try and make sure that processes are followed. They offer an illusion that the regulator is in control, which is why nearly every RBI Governor has asked the government for permission to withdraw them from bank boards. Once we had created enough ways for banks to recover, we decided to not prolong forbearance beyond when it was scheduled to end. Banks were simply not recognizing bad loans. They were not following uniform procedures – a loan that was non-performing in one bank was shown as performing in others. They were not making adequate provisions for loans that had stayed NPA for a long time. Equally problematic, they were doing little to put projects back on track. They had also slowed credit growth. What any student of banking history will tell you is that the sooner banks are cleaned up, the faster the banks will be able to resume credit. We proceeded to ensure in our bank inspections in 2015 that every bank followed the same norms on every stressed loan. We especially looked for signs of ever-greening. A dedicated team of supervisors ensured that the Asset Quality Review (AQR), completed in October 2015 and subsequently shared with banks, was fair and conducted without favor. The government was kept informed and consulted on every step of the way, after the initial supervision was done. Simply eye-balling the evidence suggests the claim is ludicrous, and made by people who have not done their homework. Let us start by looking at public sector bank credit growth compared with the growth in credit by the new private banks. 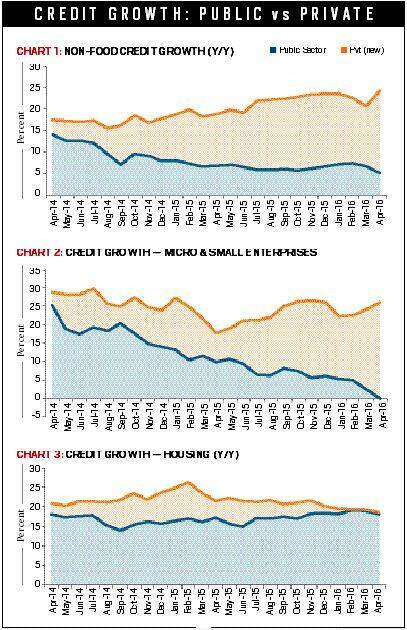 As the trend in non-food credit growth shows, public sector bank non-food credit growth was falling relative to credit growth from the new private sector banks (Axis, HDFC, ICICI, and IndusInd) since early 2014. The AQR was meant to stop the ever-greening and concealment of bad loans, and force banks to revive stalled projects. The hope was that once the mass of bad loans were disclosed, the banks, with the aid of the government, would undertake the surgery that was necessary to put the projects back on track. Unfortunately, this process has not played out as well. As NPAs age, they require more provisioning, so projects that have not been revived simply add to the stock of gross NPAs. A fair amount of the increase in NPAs may be due to ageing rather than as a result of a fresh lot of NPAs. c) The government has dragged its feet on project revival – the continuing problems in the power sector are just one example. The steps on reforming governance of public sector banks, or on protecting bank commercial decisions from second guessing by the investigative agencies, have been limited and ineffective. Sometimes even basic steps such as appointing CEOs on time have been found wanting. Finally, the government has not recapitalized banks with the urgency that the matter needed (though without governance reform, recapitalization is also not like to be as useful). That said, the judicial process is simply not equipped to handle every NPA through a bankruptcy process. Banks and promoters have to strike deals outside of bankruptcy, or if promoters prove uncooperative, bankers should have the ability to proceed without them. Bankruptcy Court should be a final threat, and much loan renegotiation should be done under the shadow of the Bankruptcy Court, not in it. This requires fixing the factors mentioned in (a) that make bankers risk averse and in (b) that make promoters uncooperative. It is hard to offer an objective self-assessment. However, the RBI should probably have raised more flags about the quality of lending in the early days of banking exuberance. With the benefit of hindsight, we should probably not have agreed to forbearance, though without the tools to clean up, it is not clear what the banks would have done. Forbearance was a bet that growth would revive, and projects would come back on track. That it did not work out does not mean that it was not the right decision at the time it was initiated. Also, we should have initiated the new tools earlier, and pushed for a more rapid enactment of the Bankruptcy Code. If so, we could have started the AQR process earlier. Finally, the RBI could have been more decisive in enforcing penalties on non-compliant banks. Fortunately, this culture of leniency has been changing in recent years. Hindsight, of course, is 20/20. 2 Back to PISA after 2009 poor show: how does it assess 15-year-olds?